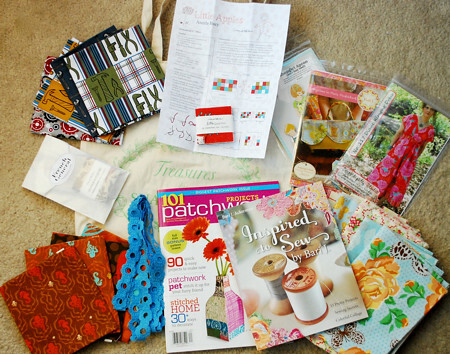 Give Away Day and Quilt Market post all rolled up into one amazing post! - Stop staring and start sewing! 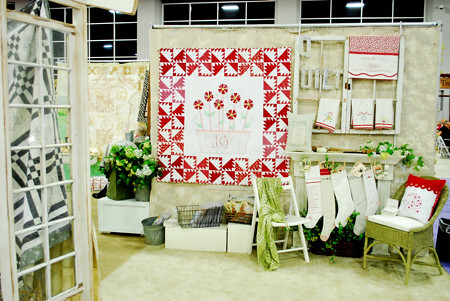 Give Away Day and Quilt Market post all rolled up into one amazing post! I'm super lucky because I just got back from a few days partying with Kristin (she IS Sew Mama Sew!) and more of the Sweet Hot Yams (to understand what a Sweet Hot Yam is you must go here for the official definition) in Salt Lake City. 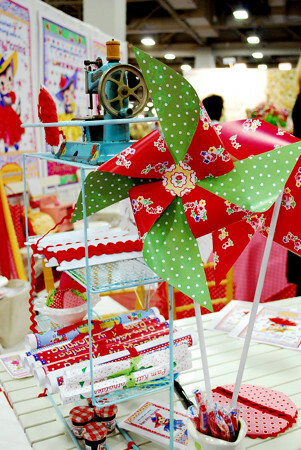 They, generously, hosted a wonderful mixer at Quilt Market and presented everyone with homemade goodies and amazing pastries. 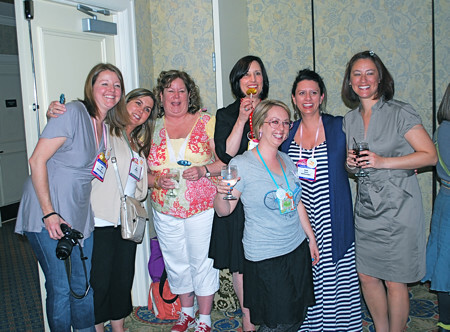 Here are Violet Craft, Mo Bedell, Monica Solorio-Snow, Kristin Link, Heather Bostic, Shelly Figeuroa, and Traci Butler representin' for the Yams. The BEST part of market was my time spent with these women (and a few more who know who they are, and a couple of guys too!). We stayed up until the wee hours (I say "wee" hours because we laughed until we wee'd our pants) and it was so hard when everyone started catching their flights back home. Thank you ladies! Today, I'm going to show you some of the stuff the ladies at Lecien have been up too. I wish I had more pictures but you'll still be impressed (and definitely visit their sites because these are some talented gals!). 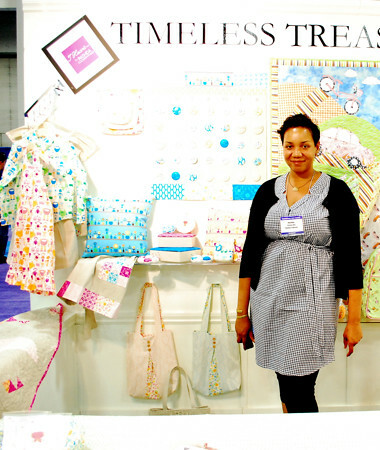 This is Lynette Anderson and her beautiful new Christmas collection. 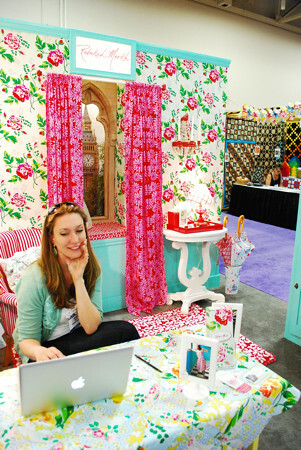 Here is the booth of Meg Hawkey of Crabapple Hill Designs. 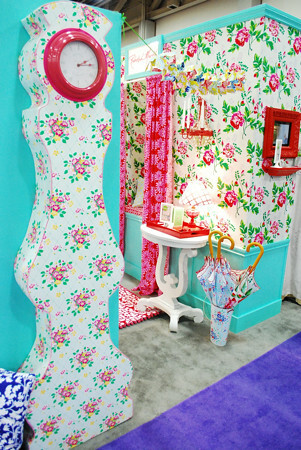 Really wonderful booth! 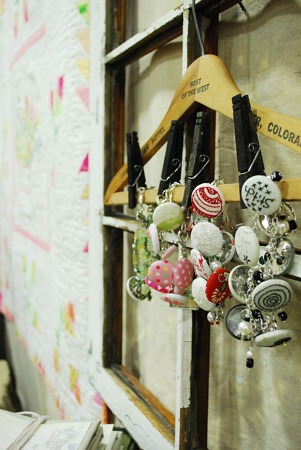 You can go here for the pattern for these gorgeous button bracelets, and to look at Meg's other designs. Here is one of Lecien's terrific guys wearing a darling apron made from Bari J's new Paris Apartment fabric. He tried to get out of the way but he looked too cute so I said "Oh no....you need to be in the picture" and he graciously obliged. 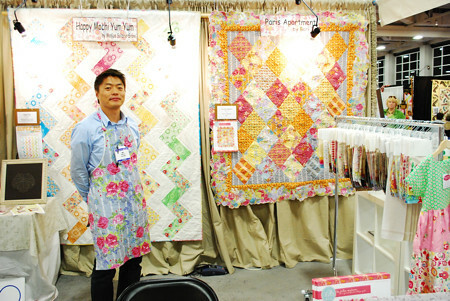 He's standing in front of Monica's gorgeous Super Zig quilt made from her Happy Mochi Yum Yum fabric (and it's sooo Happy!!!). I wish I had a better picture but you can go here for this free pattern (and a bunch more!). 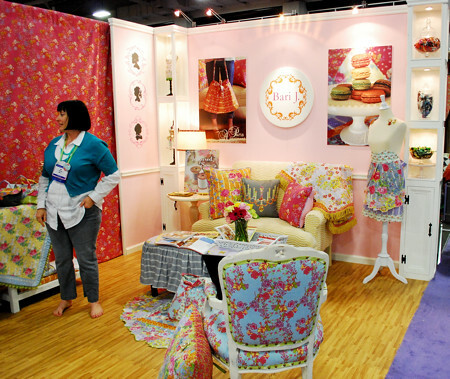 Here is my dear friend Bari J Ackerman standing in her beautiful booth (which her super hubby built!). Stunning, right? You know it. A close up of her couch (and that chandelier pillow!!). Dreamy, swoony, sigh! 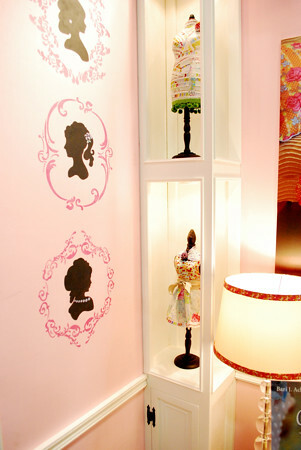 Cabinets with min-dress forms and Bari's new cameo stencils on the wall. The woman does everything. Here are Lisa Lam (who has a great new book), Bari, Valori Wells, and myself, hanging out. 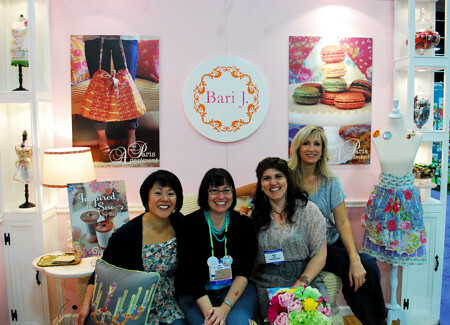 I must've spent hours over at this booth with Bari and her friend Janis. They are just so much fun. 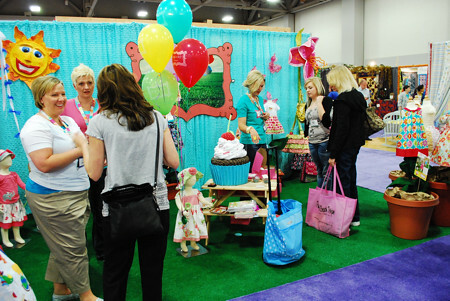 Here is another part of the Lecien booth area. 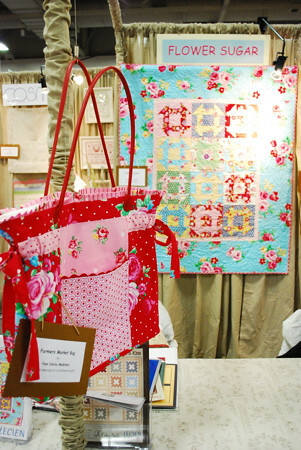 I love this Flower Sugar collection and I especially love Pam Kitty Morning's bag made from it! Speaking of Pam Kitty Morning....look at her "booth" (it was more like her own personal Pam Kitty Compound, with candy and everything!). 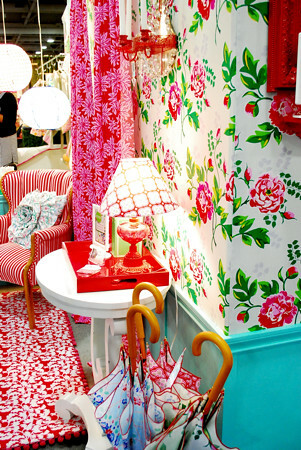 Pam has a dreamy, darling new collection of fabrics with Lakehouse Dry Goods (I know, it's about time, right? ), and it is PERFECT!! It's got a vintage feel with thoroughly modern colors. And the kitties!!!! It couldn't happen to a nicer person. To know Pam is to adore her! This booth was cute X 20!!! And here are Shasta and Jana from Izzy and Ivy Designs. They have some of the cutest patterns and their new ones are my favorites yet. Plus they're stinkin' fun (so I spent a lot of time lurking over here too)! I finally got to meet Rashida Coleman-Hale and she has so much going on that you really need to go over to her blog to see everything. This is not a great picture of her fabric so be sure to go take a good look at it because it's crazy cute! She's just nice and so very inspirational. 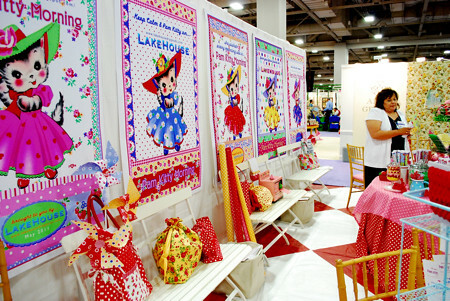 This was one of the booths that really grabbed my attention and I really wanted to pick Rebekah Merkle's brain because I've never heard of her and here she shows up with this glorious fabric collection and amazing booth. Go to her blog and check her out because she has a darling house and a great story! These colors (and the scale of those roses)!! She went over the top with all this cuteness!! Keep your eye on her! Okay, here's the loot. 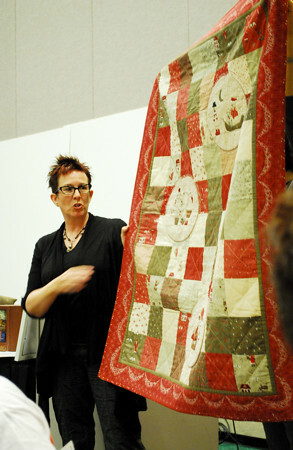 It's a big pile so pay attention my dears....Bari J. Ackerman's Inspired To Sew book (signed by Bari!!! 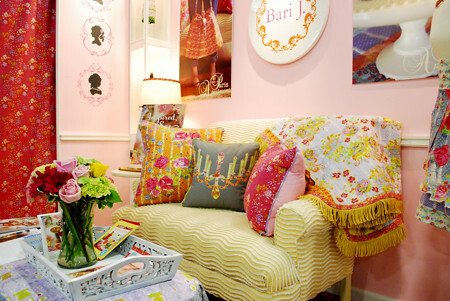 ), over 2 yards of Bari's Country Lane collection (Paris Apartment isn't out yet but you'll need it!) 101 Patchwork Projects (a 20.00 magazine, but it's just chock full of stuff you want to do), 4 fat quarters from Heather Ross's Mendocino collection, 4 fat quarters from Douglas Day's Be a Man collection, a stack of Aneela Hoey's Little Apples fabrics (42 squares) with a pattern for an embroidered pillow, A similar stack of the newest French General collection with a pattern, some of my favorite funky blue trim, my Shopgirl Apron Pattern, Bari's Springtime in Paris Pocketbook pattern, Serendipity Studios new Diane Kimono Dress pattern, and a darling Shabby Chic tote from Rachel Ashwell to keep it all in. It's valued at over 120.00!! So just leave a comment (if you want you can follow me on Twitter, Facebook, Pinterest, and Flickr and join my RSS feed in the left sidebar)! I'm sorry but, due to the size of the package, I'm only shipping in the US. While you're here be sure to check out my tutorials including my downloadable ruffled shower curtain tutorial. I have many more coming and am hoping to make some fun announcements soon too! This give away is open until Wednesday night (the 25th), which is great because I need a couple of days to sit on my couch since I seem to have caught someone's nasty bug. Have a wonderful week!! And thanks for stopping by! !